It’s been a while since I was last let loose on the Neo4j blog, and I’ve marked my return with some good news. 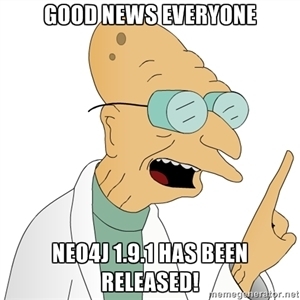 This week marks the release of Neo4j 1.9.1, numerically at least just a maintenance release in the 1.9 series. If you’re a 1.9 user, you’re strongly recommended to upgrade to 1.9.1 and new users should proceed directly to 1.9.1. You won’t need any store upgrades going from 1.9 to 1.9.1 so it’s an easy upgrade.